I love photographing wedding celebrations held at any of the vineyards in the wine country on the north fork of Long Island, New York. Whether it is Macari Vineyards, Raphael, Martha Clara or Vineyard Caterers, where this image was made, the vineyards provide a beautiful backdrop for elegant or casual wedding events. Your wedding guests are treated to sprawling views of the vineyards while they celebrate with you on your special day. The wedding picture was made right after the bride and groom were pronounced husband and wife and walked down the aisle to the cheers and applause of all of their guests. 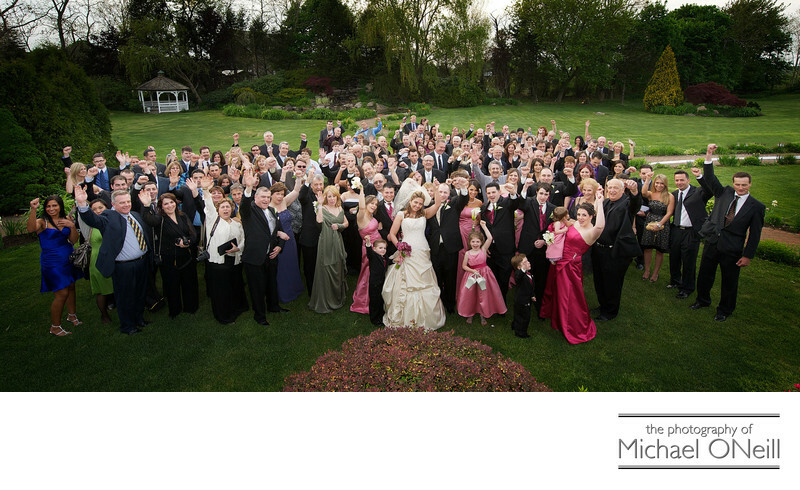 My assistant and I quickly assembled all of the guests, at the bride’s request, for one large group photograph of all of the folks who came to celebrate with them on their special day. After this shot was taken the guests retired to the outdoor terrace overlooking the vineyard where the cocktail hour was spent as the sun set to the west. If you are planning a vineyard wedding at any of Long Island’s premier wineries give me a call to discuss your plans for the big day. I’d love to collaborate with you to capture all of your memories for a lifetime of enjoyment.